Photograph of 9 of the 10 Laureates taken at the Waterstones party in Piccadilly last month. From the top left on the ‘tall row’; Michael Morpurgo, Chris Riddell, Lauren Child, Michael Rosen and me. Front row; Malorie Blackman, Jacqueline Wilson, Julia Donaldson, Anne Fine. Here's another teaser from Anthony's current project - what do you think? We've just spotted this vintage clip on youtube of Anthony talking about his book A WALK IN THE PARK. Watch from 9 minutes in to learn more about this wonderful book and its creator. Anthony produced the dummy for this book whilst staying at a Danish writer's retreat in 2003. At first it was called 'Where are you Dad?' and his images were heavily inspired by the snowy forest that surrounded him. As you can see this dummy is very detailed and the pictures are not that different from the published images. The story is evidently influenced by fairytales (most notably Little Red Riding Hood), but it also draws from a real childhood experience. Anthony says; 'I was about six years old and my grandparents were supposed to come to our house for Sunday lunch. I had a new plastic rifle that I was keen to show them at the earliest opportunity, so my parents told me I could walk to the bus stop and meet them straight off the bus. I got to the bus stop, rifle cocked at the ready, but the bus didn’t come, so I decided to walk the two or three miles to their house all on my own. For the first part of the adventure I felt pleased with myself. I looked great with the gun, and walking to my grandparents’ house was the kind of thing that grown ups did! But soon it started to snow, and the road became less familiar. Before I knew it I was lost, freezing cold and terrified. To read more about Anthony's ideas and inspiration why not read his biography? We recently shared some images from Anthony's current book 'Little Frida', and gave some insights into his working practice. Many of you asked to see more examples of Anthony's dummies, so we thought we'd travel back in time to 1982 and look at his original working drawings for 'Gorilla'. You can see how some of the ideas for text and pictures remained unaltered once published, but others were changed and embellished dramatically. Why not support your local high street and treat someone to one of Anthony's books? Anthony is currently working on a new book called 'Little Frida'. 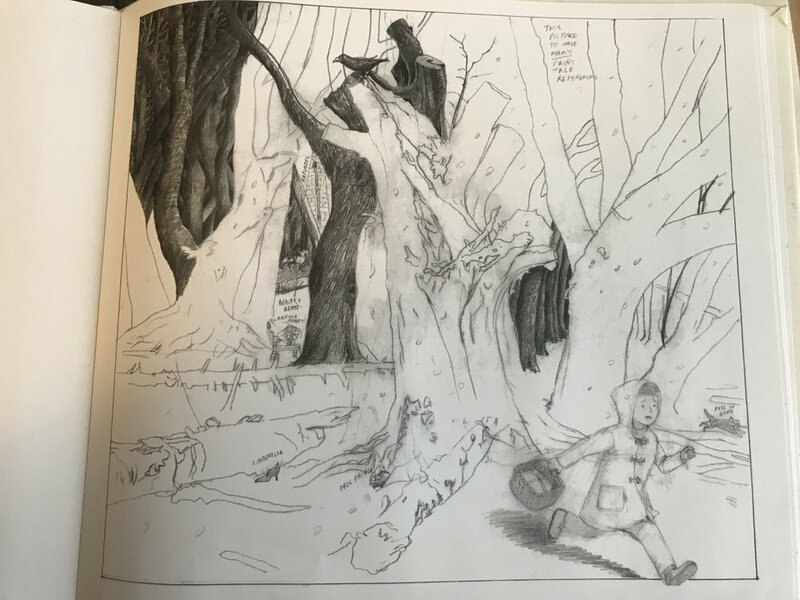 We asked him what techniques he uses to write and illustrate a new story and this is what he said; "I tend to do lots of pencil drawings to begin with (roughs) and then go on to make a dummy. Ideas can sometime take a long time to come together. I then normally use watercolour for the paintings and gouache as a coverup." Here are some images from his recent dummy. Anthony's 50th book is now on sale! Anthony's new book is available to buy in the UK! Anthony's HIDE AND SEEK will be published in the UK on 5th October. Anthony discussing his final art degree exhibition, 'Man is an Animal' (1967). '... The exhibition consisted of four large oil paintings and a book. The pictures in the book were of people indulging in typical everyday activities, but the accompanying text for each image described basic animal behaviour. It related to the picture books that I make now, in which the relationship between the words and the pictures is rarely uncomplicated. I like to include differences and gaps between the two components that the reader has to fill in with his or her imagination. What's going up my leg? Anthony discussing his childhood drawing. '...Most of my pictures were of great battles: soldiers, cowboys or knights in armour, caught in moments of ferocious conflict. At first they just looked like scenes of terrible carnage, but a closer look revealed jokes, speech bubbles and snippets of descriptive writing. 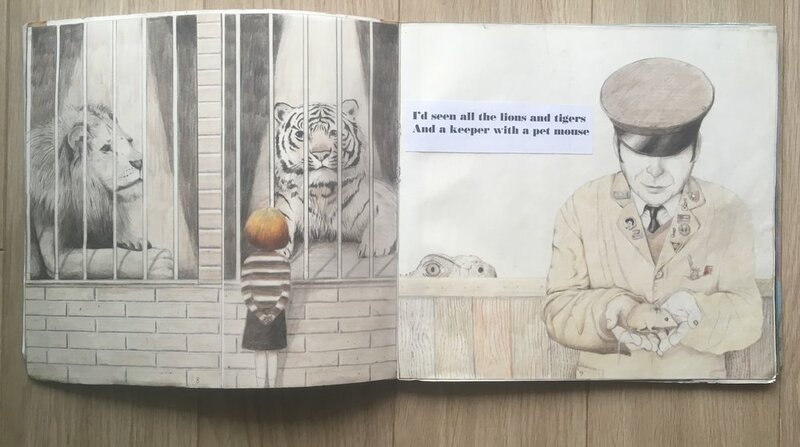 I loved to use words and pictures together, and long before I considered a career in children’s books (as a four-year-old, I saw my future taking place in the boxing ring rather than the studio), I was creating pictures that were more interesting than they first appeared. I haven’t kept any of the battle scenes, but this picture of a pair of legs (presumably mine) is fairly typical Browne, then and now. Unlike my actual legs, these have pirates hiding in their shoes and climbing up the 'masts'. I have learnt over the years that children are natural surrealists. To a child, a pair of legs has limitless possibilities; the socks and shoes are merely the least interesting starting point. I suspect that Freud would have plenty to say about the image, but I believe I had a very secure and balanced childhood! The idea for this book was suggested some years ago by Julia MacRae, my editor for the first twenty years of my career. I started work on it many times but couldn’t get beyond the word ’I.’ It seemed so pretentious writing 'I did this . . .' or, 'I did that . . .'. Over a period of time I decided that the book wouldn't work, but I would still think of it occasionally. One day, I’d been discussing the book over lunch with Julia and my son, Joe. As Joe and I walked to the station afterwards I was suddenly struck by the thought that he could help me – we could do it together! Joe had just finished his studies as a musician but he’d always been interested in writing throughout his school and university education. As a boy he would write imaginatively strange and funny tales. Joe had always been a keen listener to my childhood stories of life in Yorkshire with my brother, and he remembered some of these better than I did. Joe was very enthusiastic about the project so we started as soon as we got home and quickly realised that it could work. He would ask me questions and then record my answers. It freed me from the feeling of pretentiousness - after all I was just talking to my son about my childhood. Joe put in most of the work writing it up, partly in my words and partly in his own. He was living with me at the time, so we were able to talk about the book every day; we worked in the same room, and I was able to work on a picture book while he transformed our interviews. A recurring discussion between us was about the title of the book. I tried to think of a theme that's been common to all the work I've done and found myself returning to my childhood. When my brother, Michael, and I were children we invented two games. The first involved throwing a ball to the top of the stairs, watching it bounce back down and catching it before it reached the ground. It was the result of countless wet afternoons in West Yorkshire; the listless alternative to more vigorous outdoor pursuits, played by two bored but competitive boys. The second game - the Shape Game - was far more interesting. I have spoken of this simple drawing game to children all over the world, and they have made me realise that its prevalence in my own childhood was by no means unique. Children everywhere have invented their own versions of the Shape Game. It has certainly been a very important part of my career, for I have played it in every book I have ever made. The rules are very simple: the first person draws an abstract shape; the second person, ideally using a different coloured pen, transforms it into something. It seems that all children love this game and are very good at it – far better than adults are. It is an unfortunate part of growing up that we lose a great deal of contact with our visual imagination. The wonder with which we look at the world diminishes, and this inhibits both our inclination to draw (most adults give up entirely) and also our ability to draw with truly unfettered creativity. Looking back, I can see that although the Shape Game is great fun, I believe it also has a serious aspect. Essentially, the game is about creativity itself. Every time we draw a picture, or write a story, or compose a piece of music, we are playing the Shape Game. When children ask me (and they always do) where I get my ideas from, I tell them it's from the same place that they get theirs - from things that happened to me when I was a boy, from things that happened to my own children, from other people's stories, from films, from paintings, or from dreams. Everything comes from somewhere else, and when we create something we're transforming our own experience into a picture, a book, or perhaps a piece of music. We are playing our own Shape Game. We will be sharing more extracts from Anthony's biography over the coming weeks - so watch this space. I have just started work on a new book called The Little Artist. This is the first picture - does it remind you of anyone? I've finally handed in the finished artwork for HIDE AND SEEK (formerly known as HIDDEN) to my publishers at Penguin Random House. It's due to be published in October 2017, so watch this space! I have just received some lovely photographs from an exhibition has just finished in Viry-Chatillon, France. It looks good and sounds like it was a great success.